Last season (2015-16) was nearly a perfect campaign for the Rouen Dragons, one of the top ice hockey teams in France. They won the Ligue Magnus, the French hockey premiership, captured the Coupe de France in France’s top knockout tournament, and finished 2nd in the newly reborn Coupe de la Ligue tournament. They also went undefeated in route to capturing the International Ice Hockey Federation’s (IIHF) Continental Cup against the top qualifiers from Poland, Italy and Denmark in the final. 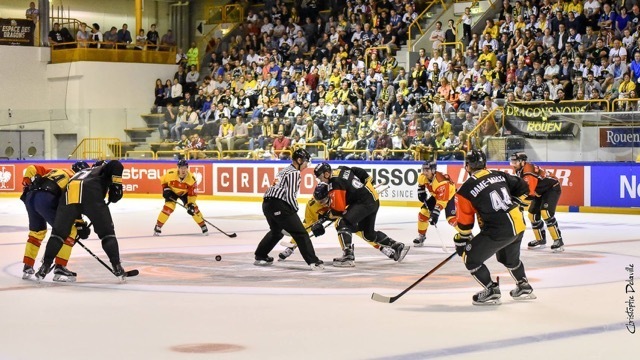 As a result of winning the IIHF Continental Cup, the Rouen Dragons were awarded a berth in the Champions Hockey League for next season. 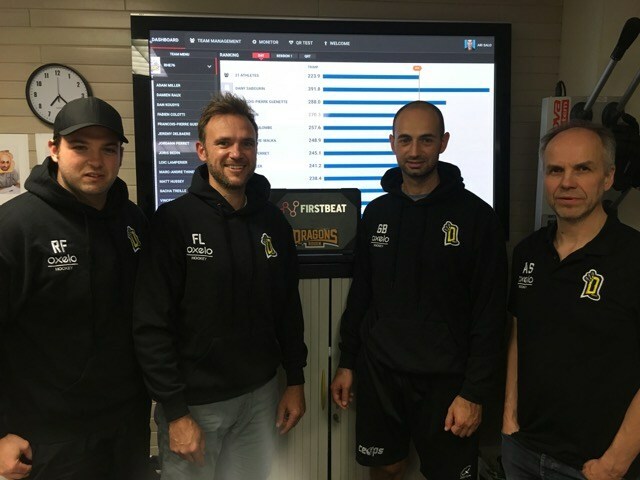 Firstbeat Sport Manager Veli-Pekka Kurunmäki recently caught up with Dragon’s Assistant Coach Ari Salo to talk about how their team utilizes Firstbeat’s physiological monitoring capabilities to create memorable performances. Salo joined the Dragons in 2014 and was instrumental in introducing the Firstbeat Sports training monitoring system to the team. You’ve been working with Firstbeat Sports for quite a long time. Tell us a bit about how you got started and how you ended up transitioning from Finland to coaching in France. “I first encountered Firstbeat Technologies quite a long time ago, in 2004, there was a local news story that ran while I was coaching at JYP hockey club in Jyväskylä. At that time, we were eager to investigate the effectiveness of our team’s training habits and routines, and the Firstbeat Sports system sounded like a promising tool for investigating what was happening inside the body, both on and off the ice. So how are you using the system these days with the Rouen Dragons? “We monitor each of our training sessions and have also been able to integrate the Quick Recovery Test (QRT) into our daily routines. Players enter the facility for training, pick up their monitoring belt, and perform the QRT before moving on to the rest of the day’s program. 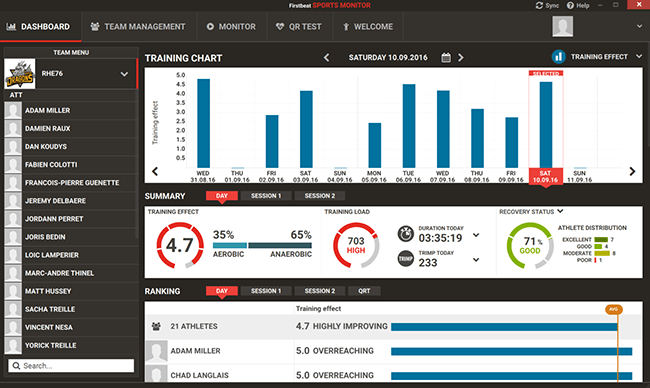 During training we use the Firstbeat Sports platform to get real-time data on players as the session progresses, and then we use the software to produce a training report afterwards. That report is shared with the entire coaching staff. They can access it via the system’s cloud dashboard, which gives them easy access to the training status of each player. What are some of the key parameters that you pay attention to when working with the team? What changes have you made based on the data and findings? “One of the big contributors to our success last year was how few injuries our players sustained over the course of the season. This is an area where monitoring has definitely helped us. We are able to see and address the recovery needs of each player. We also utilized the data to introduce new routines that enhanced recovery at both a team and individual level. For example, our games typically end late in the evening and after the games we would travel back home on a sleeper bus. During the playoffs, when the need for recovery is at a peak, we spent an extra night in the hotel, which we could objectively see gave the team better recovery rates compared to sleeping on the bus. Another thing we have been able to document is that players tend to have more stress at home after being on the road. This may be due to the reintroduction of household duties and making up for the absence from wives and girlfriends (interviewer’s note: similar findings were reported during conversations with Jokerit, a Helsinki based team playing in the KHL). As a result, we have encouraged players to add relaxation moments to their daily home routines. We also introduced mandatory post-training cool down sessions on the exercise bike after each session. For these sessions, each player is given individualized targets to enhance the lactate removal process based on heart rate which is displayed in real time on a screen at the front of the room. Have you made further changes in training routines for this season 2016-2017? “This year we started training earlier than normal, in July, and increased both the volume and intensity of our training. Our domestic French league has increased the number of regular season and the puck drops for the Continental Hockey League in August. Firstbeat Sports is the most widely used physiological monitoring platform in ice hockey; utilized by nearly half of the teams in the NHL, and teams competing in the KHL, AHL, NCAA programs, teams from all European top leagues and National teams competing at the IIHF World Championships and Olympic Games.